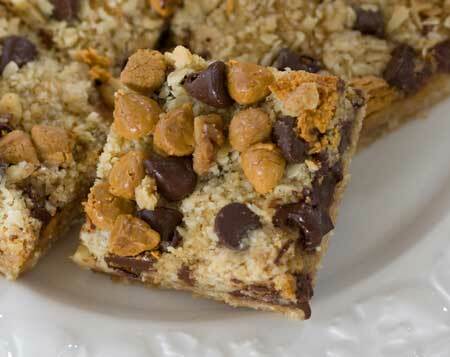 Similar to Hello Dollies and Seven Layer Bars, these bars have a crust and topping made with oats. Preheat oven to 350 degrees F. Line a 9x13 inch pan with nonstick foil or line with regular foil and spray with baking spray. In the bowl of a food processor, combine flour, oats, brown sugar and salt. Pulse to mix. Add butter and pulse until mixture is dry and sandy. Reserve 2/3 cup oat mixture and press remainder on bottom of the pan. Bake 10 minutes. Pour sweetened condensed milk evenly over crust. Mix together the nuts, chips and coconut and sprinkle in an even layer across the condensed milk. Sprinkle the reserved oat mixture over the chips and press down slightly. Bake on center rack for 25 minutes or until lightly browned. Remove from oven and sprinkle a few more chocolate and butterscotch chips on top. Let cool completely, and then cut into bars.